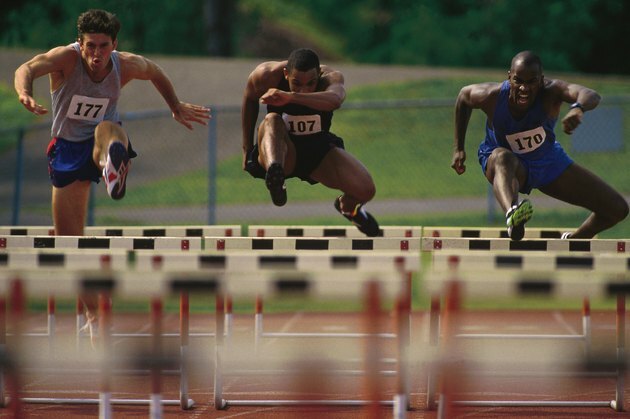 Athletics is often used synonymously with any sporting activity, but in most cases, athletics refers primarily to track-and-field events that involve running, jumping or throwing. Those athletic events are most closely associated with the Olympics, but competition in these sports is held at the youth level, high school, college, and professional ranks all year round throughout the world. The first Olympics in ancient Greece go back at least as far as the eighth or ninth century B.C. While such sports as boxing and equestrian events were included, most of the events were those now classified under athletics or track and field. They included running, jumping, discus and the javelin. Those four, plus wrestling, made up the pentathlon. The running events included "stades," which were essentially sprints from one end of the stadium to the other, a distances of about 190 meters; two-stade races; longer-distance races of between seven and 24 stades; and a two- or four-stade race in which the competitors wore armor. Running and other athletic events have long been a part of many cultures, but in the 19th century, such activities were becoming more popular, particularly in Europe and the United States. School curricula included athletics and in 1896, the first Modern Olympics were held in Athens, Greece. Events included the 100-meters, 400 meters, 800 meters, 1,500 meters, 110-meter hurdles, pole vault, discus, shot put, javelin, long jump, triple jump and high jump. Fourteen nations were represented. After the 1896 Olympics, the popularity of athletics, or rather, a revival of athletic competition, took place around the world. National athletics federations from 17 countries got together to form an international governing body and in 1912, the International Amateur Athletic Federation was born. For many years, the pinnacle of athletics competition was the Summer Olympics. But in the 1970s, more world championships in various events began to take place, helping to maintain interest in track and field every year. By 2011, nearly 50 outdoor and 25 indoor events fall under the IAAF's authority and rules. Some events, such as the 50-meter sprint, are no longer part of major athletic competitions, but remain part of school programs. Some events have been modified through the years and races of many varying distances are contested every year. In addition to the 26.2 miles of the marathon, there is a 13.1-mile half-marathon. There are men's and women's competitions in almost every event. Men, however, can compete in the 10-event decathlon, while women have the seven-event heptathlon.